No details of this have yet been announced, as the content will not be known until the completion of the Paralympic Games. Two former North British Railway 4-4-0, “Glens”, LNER and BR Class D34, 62471, Glen Falloch and 62496 Glen Loy at Ardlui on 09 May 1959, the West Highland Line from Glasgow to Fort William and Mallaig. They were built by the NBR at Cowlairs in 1920/21 to the design of W P Reid. There is more details of these on our website. More details of these can be found on our website. The Christmas stamps this year have been designed by Webb and Webb using new illustrations by Axel Scheffler - the artist who illustrated the children’s classic The Gruffalo. As usual the stamps will be in standard and large letter definitive size and self adhesive. There will also be a conventionally-gummed miniature sheet containing all stamps, booklets of 12 x 1st and 12 x 2nd stamps, and a Smilers Generic sheet with (updated) 4 x 2nd, 4 x 1st, 2 x 86p and 2 x £1.28 stamps. Correction: As Brian points out in the comment, this year's prices will be 87p, £1.28 and £1.90. The pictures shown are the preliminary ones we were provided with in February. And as Trevor pointed out, the date we were originally given by Royal Mail and which I used without checking the calendar, was Sunday 11th. Now confirmed as Tuesday 6th. And I am afraid that after 35 years of collecting ALL GB, together with the recent Royal Mail debacle and the one yet to come; this will be my LAST issue! RM have beaten me to the point of cutting any ties with them altogether and will ask them to remove me from any mailing list/regular order in my name after the Christmas Issue, giving the 6 weeks required notice!! Night Night RM, pleasant dreams? Anonymous 1, Not sure I would call them Awesome, their simplicity would not look out of place on cheap christmas cards, having said that I still like them enough to add to the collection. Anonymous 2, Can you explain what the connection is between your obvious disgruntlement with RM and this Christmas Issue? And please explain for us novices what recent and future RM debacle you refer to, as I have no clue what you mean. Jeff, sure, it is explained in one phrase! Olympic Gold Medal Winners and Compendium debacle; the one that has passed and the one yet to come! Thank you Brian. If I hadn't been so busy with Olympic Gold Medals I might have noticed myself. These are the pictures we were supplied with in February before the new rates were known. What have these to do with Christmas ? As these, like others have nothing to do with the anniversary of the birth of Jesus. I've allowed your comment under our Freedom of Speech policy, but also because it gives me a chance to say what you probably already know - and if you don't, where have you been buying your stamps for the last 5 years - that Royal Mail adopts a secular and religious approach to Christmas stamps on alternate years. But - as you undoubtedly also know - 1st and 2nd class Madonna & child stamps based on works of art, are issued every year. Ian: I have often wondered the status of these Christmas reissues. Do they come from old stocks or are they reprinted? Have any variations been detected in each reissue? Although Royal Mail philatelic say that they are 'as the original issue' I believe it has been detected from the printing dates in the margin, that there have been several subsequent printings. The variations in shade are no more than are found in a normal print run of millions of stamps. I'm always impressed with the way you keep your site as up to date as possible; the Olympic Gold Medal stamps appeared the day after, and now you have illustrations of the remaining stamps for this year, Paralympic Gold Medals apart of course. Royal Mail seems reluctant to update their web site until absolutely neccessary, so you are always several steps ahead, and therefore providing a useful reference point, when it comes to keeping collectors fully informed what's going to happen. No doubt we shall learn from this site what the proposals are for next year before RM gives us the information. Keep up the good work. I concur Mike, Norvic Philatelics are the first for news; the first place I look anyway! 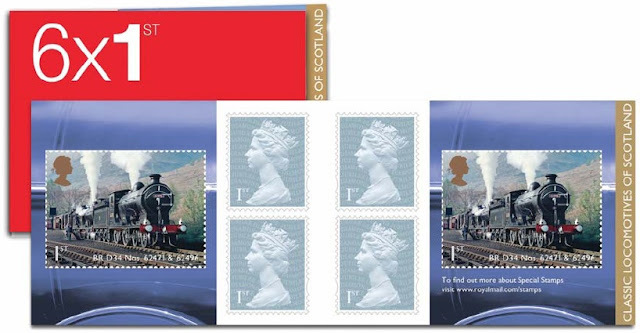 One thought for the near future though, what is the Royal Mail going to do with the 2012 Yearbook, a pictorial book that celebrates all the years stamps? That is where I think RM should consider leaving them out of the Year Book because the GMW have a compendium of their own? Given the lead time for design and printing (even in China), and assembly with stamps included, I think the year book is already close to being printed. My guess is that they will go ahead now that the Dinosaur stamps have been postponed until 2013, and that all the Gold Medal stamps will be excluded. Don't forget that as well as the 29 Olympic GMW stamps/sheets, they would have to include an as yet unknown number of Paralympic GMW stamps/sheets. I actually think that this years Christmas stamps are Ok. But, I sense that it is beginning to show that perhaps ideas have become a bit dried up. I guess there are only limited things you can put onto a Christmas Stamp and at the same time remain original. Originality however, is lacking on this years set. That said, bravo to RM for continuing with festive stamps and maybe come 2014 and it's secular theme we could have some stamps featuring different Christmas lights! (Which was I believe to be the theme of 2003's festive stamps but instead we got those fabulous snow sculptures, which remain amongst my favourite set to date). Still, will be intrigued as to what variation of the Nativity they can come up with next year! Thanks Ian for all your replies and for such a stunning website. 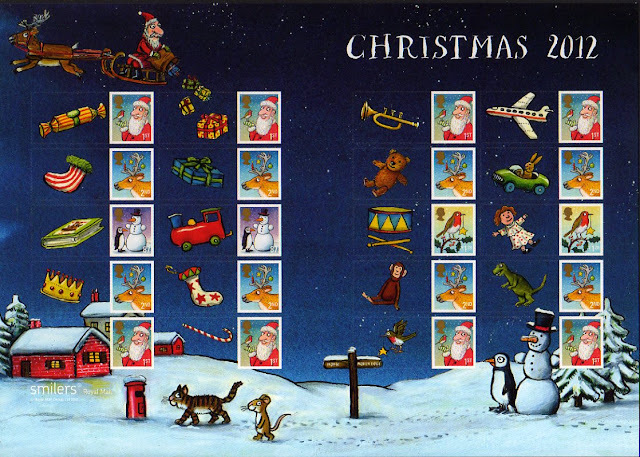 As Steve Wickens rightly says, the scope for fresh ideas to illustrate the biannual secular Christmas stamps is running-out fast. Perhaps a series devoted to Christmas bestselling singles might be an idea for the future (2014 perhaps?). You would need five (two of which would double-up on the 1st & 2nd class Large stamps), so I would suggest John Lennon & Yoko Ono's "Happy Xmas (War Is Over)" (1971), Slade's "Merry Xmas Everybody (1973), Chris de Burgh's "A Spaceman Came Travelling" (1975), Wham! 's "Last Christmas" (1984) & Band Aid's "Do They Know It's Christmas?" (1984). Re: Madonna & Child re-issue query. I have 2009 printings 1st 2/6/09 and 2nd 18/5/09. For 2010 the 1st is 8/8/10 and the 2nd 24/7/10. However, when I purchased stamps before Christmas 2011 they were the same as the 2010 printing. I can't detect any colour variations. There has to be a way of coming up with new ideas. Perhaps they could launch a "Design a Christmas Stamp" competition. For the religious element they could use images of different Cathedrals, or again focus on different Carols (they did this last in 1982). 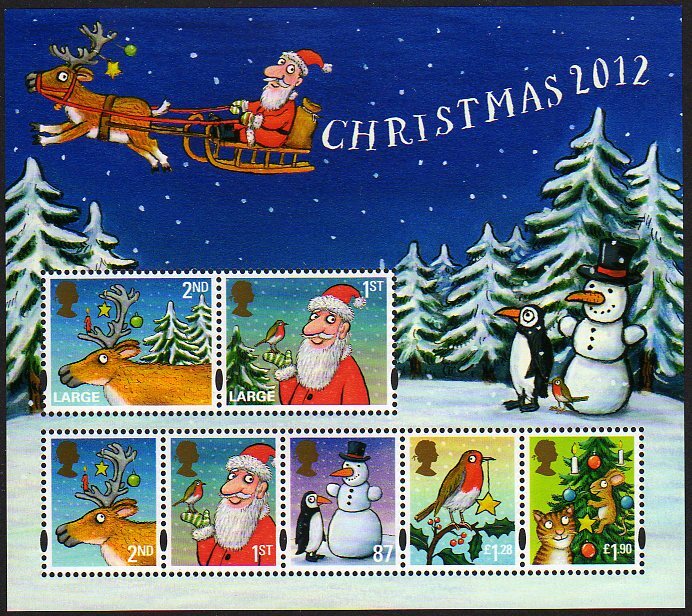 I also wish they would revert back to the old size for Christmas stamps. Detail is restricted on these definitive sized stamps.